As we draw to the close of another landmark year in the financial markets, it’s a good time for traders/investors to critically review their past years performance, and prepare for the upcoming years ahead. What worked and what failed to work for you in 2010, 2009, and 2008? Where are the markets headed in 2011 and beyond? Will the infamous approach of the Mayan calendar phenomenon break the back of the bull – spawning another primary bear market event, or will Dec 21, 2012 come and go with little or no fanfare? No matter what unfolds, rest assured that civilization shall continue to thrive. Just to be prudent, prepare for the worst, expect the best, and realize that you are the master of your own destiny. As you may know, we are big believers in organizing ones trading/investment efforts to focus upon specific timeframes and objectives. Over the years we have developed five levels of strategic engagement. Each addresses a different timeframe and tactical approach to trading/investing. We have taken four of the five and coded their underlying strategies into the TradeStation platform. We have been trading them for the past year with great success, and are now ready to share their exemplary guidance with our subscribers. The following quantifies how these systems performed over the past three, five, and ten year periods. We will be using the popular S&P E-mini futures contract as a proxy for our historical performance summaries. 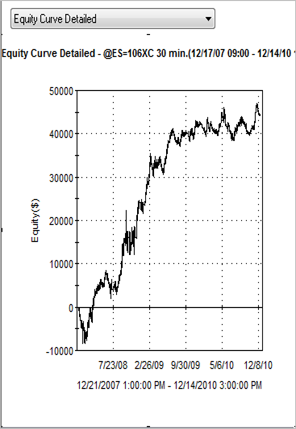 Each of the systems entry and exit parameters can easily be applied to ETF’s or Mutual Funds that mirror the S&P 500. Level-I is a long-term CORE position strategy coded to capture the lion’s share of Elliott wave movements from the Cycle to Intermediate dimensions of trend. At Levels-I through III, we will also provide coverage for the YM contract, which is the Dow E-mini futures contract, as well as the NQ’s, the E-mini contract for the Nasdaq 100. Note: Each of the historical performance summaries include provisions for slippage and commissions. The last two rows of each summary pretty much tell the tale - spelling out how you would have fared buying and holding during the period vs. the system generated return on capital. What look like price charts below each performance summary, are the associated systems equity curves, which represent all of the ups and downs experienced over the course of the test period. Level-II is also longer-term strategy. However, the concept behind Level-II is one of hedging and enhancing larger CORE exposure at Level-I. Note the suggested difference in account size and number of contracts traded relative to each level of engagement listed. 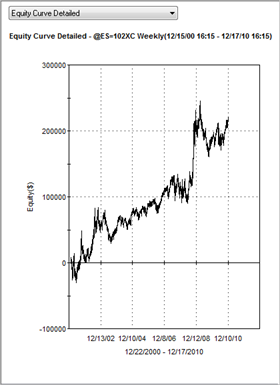 Level-II is coded to capture the lion’s share of Elliott wave movements from Primary to the Minor degree of trend. As such, Level-II is quicker to stop and reverse in anticipation of potential trend changes, which always carry the potential to turn into larger moves. When this occurs, Level-II gets out in front of the larger core positions held at Level-I, and hedges its interest. If the move turns into something larger, which ultimatley reverses Level-I, Level-II has already gotten a head start on it. Unless Level-II acts upon an anticipated terminal, it is otherwise positioned in the same direction as Level-I, enhancing vs. hedging its performance. Level-III is a medium or intermediate-term strategy. Level-III has similar dynamics to that of Level-II, but trades off of daily bars vs. weekly bars. Again, note the difference in account size and number of contracts traded relative to each level of engagement. Level-III is coded to capture the lion’s share of Elliott wave movements anywhere from the Intermediate to Minute degrees of trend. Given that Elliott waves represent market trends at varying degrees, Levels I through III are designed to capture those trends. As such, the first three levels of engagement will never catch market tops and bottoms. Each level can be used as a standalone strategy or they may be combined to affect a larger trade plan. Combining levels can be accomplished by using multiple accounts, different trading instruments, or by trading different but correlated markets. Level-V is our short-term counter trend swing trading methodology. We have coded Level-V to anticipate and capture Elliott wave terminals from subminuette to minute degree. We trade and report advance notice guidance on this systems activity using the standard cash markets trading hours. This system generates anywhere from 8 – 15 trades per month. Trades are held anywhere from hours to days. Rarely if ever will a trade last more than a week. From a systems traders perspective, the algorithmns driving Level-V’s decision making process dynamically reference a variable number of bars back to anticipate pending wave terminals. As such, as price and time unfold, Level-V ignores all price bar data that is older than the current number of bars under dynamic reference. This is unique in that the methodology depends only upon the most recent price action, and does not rely upon historical data beyond its immediate sampling needs to make trading decisions. All of the NEW Systems Trader services listed above will be made available on a standalone basis. This is a fantastic low-cost access option for those simply interested in getting the exemplary signals and trade alert guidance. If you want to get the chart work and technical analysis responsible for generating the signals, you can get that too! 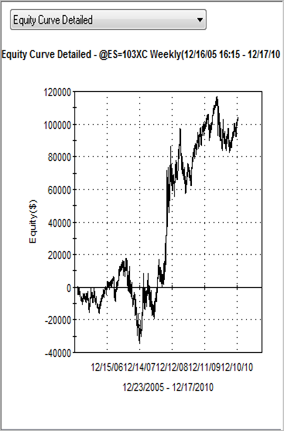 Each of the Systems Trader services can also be bundled with companion access to our charting and forecasting packages. Segmenting the chart side and systems side allows users the flexibility to create a custom suite of services that best suits their needs and price point preferences. To help readers envision the plethora of opportunities forthcoming in the financial markets, we are preparing one of our most critical forecasts to date. Using the Dow Jones Industrials as a proxy, we will lay out precisely where equity markets reside within their primary bull markets, where they are headed next, and exactly the path they may take to get there. Our ongoing thesis maintains that equities have been rising in a primary bull market advance within the context of a larger secular decline of Supercycle dimension. We have also headlined this forecast, “Elliott Wave, the Next Generation”, it is subtitled, “Of IV Down”, named aptly for the wave and degree of trend currently in control of the markets. For the past 15-years, legions of Elliott wave enthusiasts have continually been disappointed by a singular voice of authority on this topic. The time has come to break this monopoly, and to embrace a new alternate voice with fresh and less rigid perspectives. Hence, we trust our two headline titles on topic are appropriately tagged; “the Next Generation”. More importantly, and central to all of our efforts in preparing this forecast, is the privilege to share with readers an absolute means by which to profit and navigate safely throughout the course of the many bull and bear markets set to unfold over the next decade. Most of you are well aware that Elliott wave theory is by default, a rather subjective and discretionary method of ordering price behavior. Its tenets incorporate a variety of simple and complex wave patterns, which if sequenced perfectly, then suggest a rather high level of certainty that markets will produce a specific future outcome. If one is either self proclaimed or an actual authority in the discretionary application of this theory, there can be a tendency to roll the dice on a singular authoritative wave count. If such an expert or known authority provides too many “alternate” outcomes, well then what is the practical utility of Elliott wave? Therein lays the very point we shall argue here. In quest to grab the brass ring of guru fame, there is great temptation to bet the ranch that one’s discretionary wave count thesis will turn out to be right one. Stridently arguing the case for a subjective wave count with any sort of fundamental underpinnings, or wrapping them with ties to social trends and current events might be entertaining, provide food for thought, sell products, and duly impress, but the odds of that count being “the right one” are slim to none. Stunning arguments of this sort were presented brilliantly in 1995, which called for a major bear market to the likes of which no one could possibly fathom. Four years later, the Dow quadrupled in value. Oops. Another example of going for the brass ring was placing overwhelming discretionary force into reading the blatantly corrective move down into the 2002 bear market low as a first wave down at primary degree, and sticking to it until the broad equity markets achieved full recoveries, most all of which went on to print new all-time-historic highs. Similarly, ever since the recent bear market low in 2009, the highest of authorities have been beating the drum for the pending arrival of the big wave 3 down. Need we go on? Now that you have a bit more insight as to one of the many reasons why one might marry themselves so exclusively to a discretionary wave thesis, perhaps you can better appreciate our efforts toward branding a new generation of Elliott Wave. It is our view that the next generation of Elliott wave shall be one in which there are no monopolies betting the ranch on counts in the hope of claiming ownership to the call of the decade, century, or whatever. Instead, we envision that the future generation of wavers will be successful in demystifying the theory, and using the core of its brilliance in developing NON-discretionary, rules based strategies, which engage the markets using systematic and dynamically automated tactics. Basically, we have two prime directives. 1. To accurately chart and forecast the direction of markets at varying degrees of trend. 2. To provide exemplary guidance in navigating the markets based on this work. To maintain integrity in the objective dissemination of Elliott wave patterns, it is necessary that we present at least three of the most plausible wave counts that may possibly be in force. Though commonly referred to as “preferred counts”, and “alternate counts”, despite their ordered titles, each is equally viable until price action dictates otherwise. For those with extensive trading experience, framing the market in this way provides an outstanding edge from which to execute discretionary trading tactics. Those unable to devise effective approaches to capitalize on such presentations require a much more specific level of exemplary guidance to assist them. Its one thing to have a cogent market opinion, and quite another to have a rules based method to make entry and exit decisions. Even with a good trade plan, when rules are met, one must ultimately decide to pull the trigger. Thereafter, one must then manage that position prudently, and with reverence. Given the necessary ambiguity inherent in tracking wave counts with unbiased integrity, it was essential that we develop an exemplary format from which users could gain specific NON-DISCTRECTIONARY guidance to help coach them when engaged in trade amid any given timeframe. It is our firm belief that analysts MUST remain impartial to dramatic price movements, drawdowns, open profits, and the multitude of emotions involved in trading. This also includes remaining detached and void of any emotional or ego driven ties to any sort of biased outcomes whatsoever. It’s taken us nearly a decade to get there, but we have finally arrived at a solution that meets our directives without breaching the integrity needed to provide accurate, consistent, unbiased Elliott Wave and technical analysis. So, how is it that we can trade the markets, provide specific non-discretionary exemplary navigational guidance, and remain true to the impartiality demanded in charting the markets? This is where the “technology” part of Elliott Wave kicks in. The solution was to develop a suite of automated trading systems that would capture the lion’s share of classic Elliott waves at various degrees of trend. The systems would focus on the decision making process of execution and trade management, allowing us to keep a detached and unbiased focus on the charting and forecasting side of the equation. Well, we’ve done just that. In 2011, we will be introducing a brand new suite of services that will meet the dual mandates. Unbiased technical analysis coupled with specific NON-DISCRETIONARY exemplary trading guidance is coming your way soon. If you’re wondering if our trading systems have ever been positioned in opposition to one of our preferred wave counts, the answer is YES. The beauty was that the system automatically made the decision to trade an alternate count, which left us free to continue tracking an opposing point of view in holding it to task. Who won out? This time the system did. 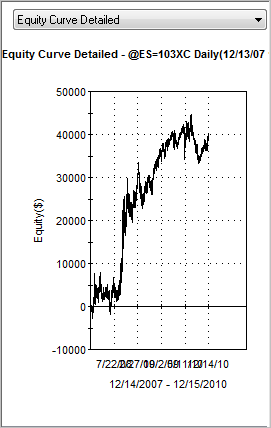 After about a week or so, price action dictated we change our preferred count to match that of our trading system. Having the best of both worlds is truly a beautiful thing. As if all this weren’t enough, we have more really good news. Our recent five-year anniversary promotion went much better than expected. As a result, our loyal subscriber base has just gotten a lot larger. This in concert with the tiered structure of our new suite of services has enabled us to lower our access fees dramatically. The result is that a whole lot more traders/investors will be able to gain access, and reap the rewards of this new generation of exemplary guidance. We have yet to solidify all of the particulars surrounding this new suite of service options. So, if you are interested in helping shape the nature and composition of these new ground breaking offerings, or if you are an existing subscriber and wish to have a say in how our new lineup is going take shape, it is VITAL that you get an invite to take our NEW SUITE OF SERVICES survey. If you have not already received one, email us and we'll send one right over. You have to act fast though, time is running out, the New Year is approaching, and we have to get the new suite of systems and services prepared to order. So, send in those surveys ASAP, prevailing consensus will help shape what will soon be the dawning of the next generation of Elliott Wave. Oh yeah, one last thing. Don’t forget to look out for our year end forecast; you don’t want to miss the chart-side of this beautiful equation.